Las Vegas recently got its first major professional sports team — the National Hockey League’s Las Vegas Knights debuted in 2017, riding a wave of local support all the way to the Stanley Cup Finals. But Vegas has always been a sports town. Even if you never wager a dime, it’s a great place to visit for a few days and watch your favorite teams in action. 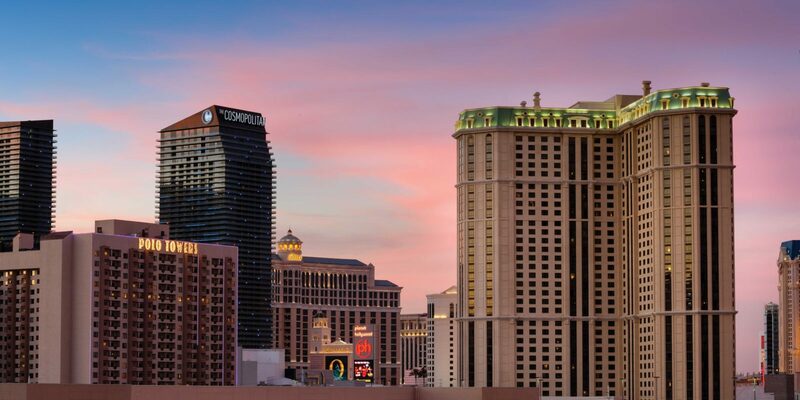 Marriott’s Grand Chateau® is a fantastic home base for a sports fan in Las Vegas. As you head to the guestroom elevators, the first thing you’ll see is a schedule for the games being shown on the giant video screen suspended over the fifth-floor swimming pool. For us East Coast residents, it was a special treat to see NFL games starting at 10 a.m. local time on a Sunday, rather than the usual 1 p.m. — pregame mimosas, anyone? There are literally hundreds of places to watch sports on the Strip and in downtown Las Vegas, and my friends and I have been to our fair share. But nothing tops lounging in the shallow end of the pool at Marriott’s Grand Chateau, favorite beverage in hand, and cheering for victory alongside your fellow resort guests — some supporters, some opponents, but all embracing the spirit of friendly rivalry. The resort’s enthusiastic Activities staff keeps spirits high, with a Sunday afternoon tailgate party featuring football-themed games and snacks. The Pool Bar and Grill provides the burgers, giant pretzels and other game-day food. We had just enough time between games to slip down to the lobby and pick up our complimentary cocktail of the day. With the Patriots on Sunday Night Football and the Red Sox in the playoffs, our mid-October weekend getaway to Marriott’s Grand Chateau was pretty ideal for a couple of New England sports fans. 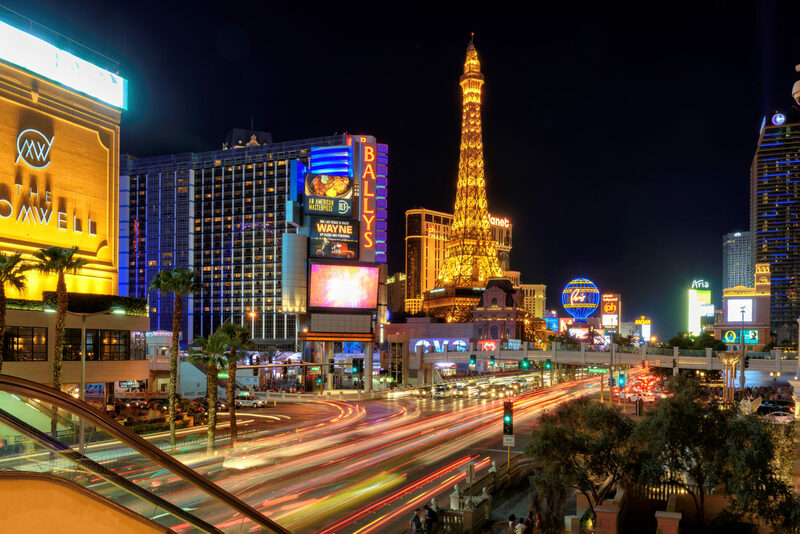 But you’ll find sports action on tap in Vegas any time of the year, from the Final Four in April to the World Series in October — and everything in between. Team jerseys are the dress code on game days, with plenty of shouted cheers (and a few razzes) as you walk down the street or through the hotels and casinos. In a town that draws visitors from all over the world, you can always find someone to root with. There are also a number of bars that bill themselves as the Vegas home-away-from-home for out of town teams, particularly those with a strong national following: Windy City Beefs and Pizza for the Bears, Cubs and other Chicago teams, for example. 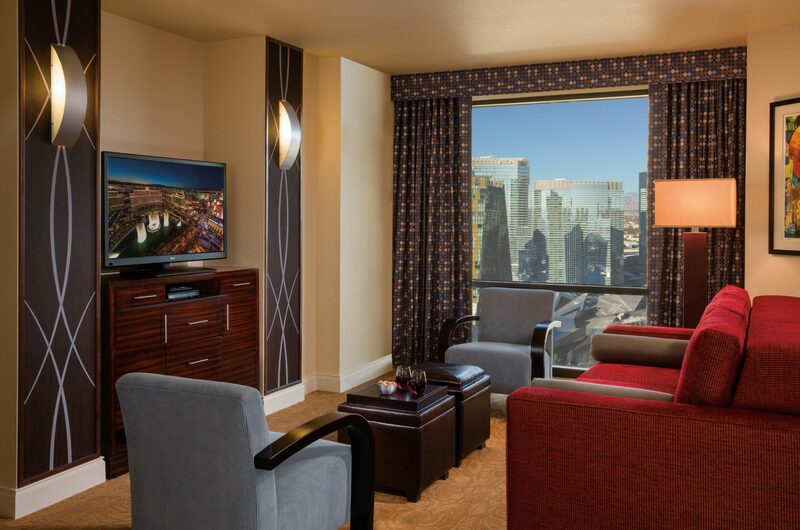 You’re never far from the action at Marriott’s Grand Chateau, whether you want to watch sports live or on TV. 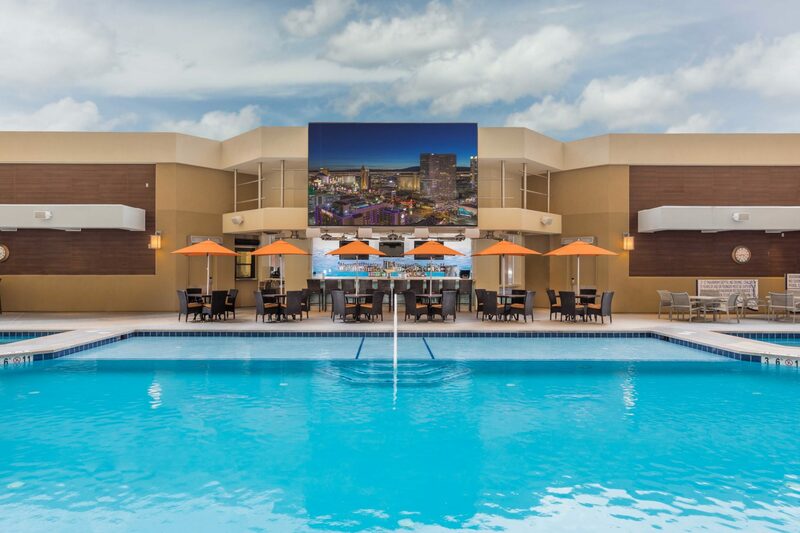 Directly across East Harmon Avenue from the resort are the Miracle Mile Shops, where you’ll find some great sports bars, including Blondie’s which has more than 60 high-definition TVs tuned to all the games. The bar bills itself as the home of the Las Vegas Knights and, in addition to the usual North American sports, also shows English Premier League and Champions League soccer games. 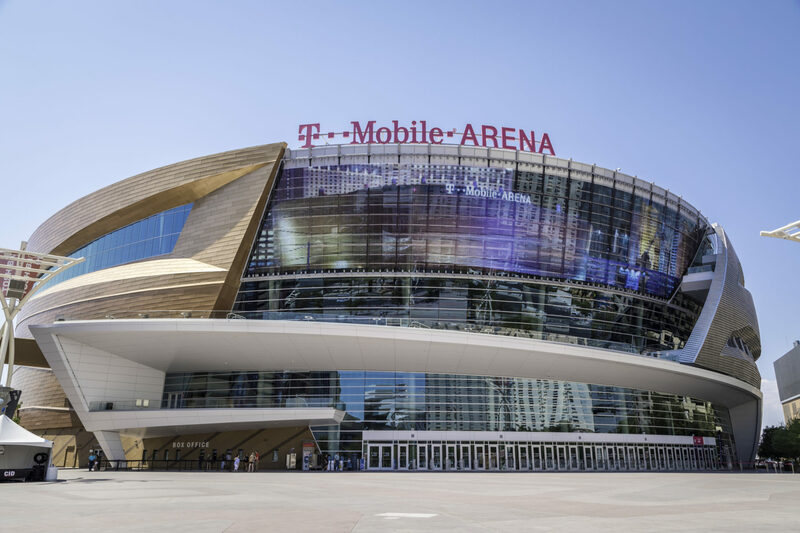 For live sports, T-Mobile® Arena, home of the Las Vegas Knights, is about a 10-minute walk from Marriott’s Grand Chateau. It’s part of a growing sports and entertainment complex behind the New York New York Las Vegas Hotel and Casino. Currently under construction a few blocks away is the new Las Vegas Stadium, where the NFL’s Raiders will play beginning in 2020, when they move to their new desert home from Oakland. During our stay at Marriott’s Grand Chateau, by the time Monday Night Football rolled around, we were ready to chill out after a long weekend of sports highs and lows. So we settled into the couch in our villa, cracked a couple of beers we had won at a poolside scavenger hunt, and snacked on leftovers heated up in the unit’s kitchen while we watched the game — a winning combination before heading home from our victorious Vegas sports weekend. Bob C. is a Marriott Vacation Club owner and a professional travel writer.